^ NASA (2007). "Extravehicular Activities (EVA) Statistics". National Aeronautics and Space Administration. Archived from the original on August 8, 2007. Retrieved November 9, 2007. ^ a b Spacefacts (2017). "Astronauts and Cosmonauts with EVA Experience (sorted by "EVA Time")". Spacefacts. Retrieved May 13, 2017. ^ CollectSpace (2007). "Astronauts make 100th station spacewalk". CollectSpace. Retrieved December 18, 2007. ^ "Astronauts Venture into Space for a Spacewalk". 14 June 2018. Retrieved 14 June 2018. ^ "Spacewalkers successfully complete EVA to replace failed EXT-1 MDM". NASASpaceflight.com. 23 May 2017. Retrieved 23 May 2017. 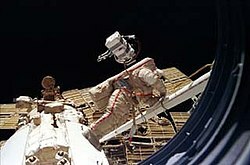 ^ "Spacewalk goes into overtime as cosmonauts deploy satellites, collect science". spaceflightinsider.com. 17 August 2017. ^ NASA. "STS-131 MCC Status Report #17". NASA. Retrieved 2010-04-13.